Doing a hardware product in India is much tougher …. What was needed is a way to connect those who need the assistance and advice to those who can help and are willing to help. The goal of this group of 10-12 individuals who selflessly give their time in organising various initiatives and events under the Innofest umbrella is to make it easier for first-time entrepreneurs and to assist them in their journey. We deliberately chose to focus on startups and individuals who were using hardware and technology to solve meaningful problems. Because that is the most underserved section of the entrepreneurial eco-system. The initial 2 years were invested in reaching out to hardware entrepreneurs and enablers who can assist them – maker spaces, companies, mentors, investors, etc., and bringing them together to interact with each other. As with many other sectors, in hardware led innovation too, resources were concentrated in 3-4 cities, while innovators were spread across the country. These innovators usually worked on their own, often spending time and energy and money on aspects that had already been solved by someone else. Getting together problem solvers and innovation enablers was a critical first step. And the community responded enthusiastically. Over 1800 innovators turned up at the inaugural in Bangalore. Since then we have taken the initiative to Hyderabad, Jaipur, Nagpur and other cities. In fact, Prathibha Sastry, the key volunteer driving Innofest took two ‘yatras’ – once driving from Bangalore to Delhi and once Bangalore to Assam – to find innovators in small towns and tier 2 cities across India. What she unearthed was awe-inspiring – folks who were solving local problems with their frugal innovations. However, many of these enterprising folks did not consider themselves as entrepreneurs. For them, they were just using their ingenuity and creativity in addressing a problem that they or someone in their family or community faced. They were solving for Bharat. And that we feel is the real opportunity. To encourage these inspired, enterprising and creative problem solvers to get their innovations to solve problems at a much larger scale than they have currently envisaged. To help spread their innovations to places that can benefit from these innovations. I.e. find innovators and help them in their entrepreneurial journey. To do that, it was important that we shift gears. And at Innofest, we have. We now have extended the goals to not just curate and connect innovators and enablers, but to also undertake programs and initiatives that will increase the chances of success of these innovations. These include providing better access to resources like maker spaces, working with large corporates in helping drive their innovation programs, creating better access to capital and markets, creating a pool of mentors, etc. Indeed, from being a festival or celebration of innovation, Innofest is now a platform for innovators to succeed in solving problems and making our country a better place. And hence, we have also taken the bold step to change our name from Innofest to Innonation, which means using innovation to improve the nation. Whether you are an innovator, or want to volunteer, or a company that wants to support innovation or a co-working space or maker space, do connect with us at Innonation. We need a lot more people in making this volunteer-driven platform successful. To get a ringside view of the innovation happening across India, join us at the flagship event in Bangalore on 26th August. If you are into solving a problem for Bharat, check the agenda to see what workshops and events are most relevant for you. See you at Innonation. The country needs you to be there. ‘Social Commerce’ or more simply ‘Social Payments’ has been a relatively new concept to come up in the last few years. And in most cases, it remained like the early days of big data – easier to toss around but not presenting a clear picture. I believe the vagueness gets accentuated by the fact of the word ‘Social’ being a part of it. This is what leads a whole set of audience out there, to think that just latching on to or simply appending a ‘pay’ option inside a social network makes up for the concept. Nothing could be further from the truth. The true meaning of the word ‘Social’ in ‘Social Commerce’ is actually the full context of your real life use cases where any social activity is involved. For example – a dinner with your friends, an act of planning and sharing cost for a gift, so on & so forth. In fact, if you actually ponder, you would perceive that the real driver of this phenomenon has been something else entirely. It is the proliferation of ‘shared economy’ lifestyle that makes these social use cases so prominent and common for us. Also your payment instances and touch points intersect across the whole matrix of these use cases. Traditionally, the process has been pretty fragmented with the social & fun experience never coming across in those payments you made with your friends. Until now! And I am sure you must have realized that the arrival of our own stack – UPI is the one of the key turn arounds (the ‘Paypal moment’) for Indian ecosystem, especially in terms of enabling ‘Social Payments’ as a category to exist independently in a big manner. 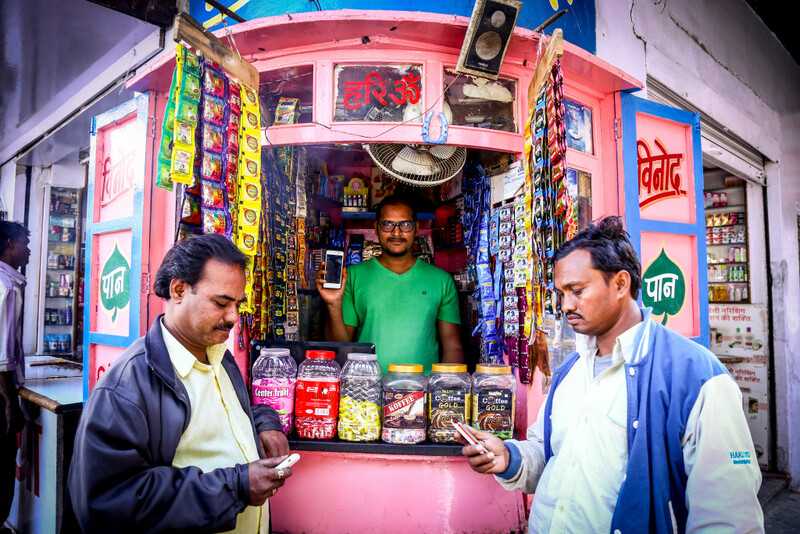 UPI has brought about 10X the simplicity and 10X the speed which is a core pre-requisite for situations where you need to share money with your friends without any awkwardness. 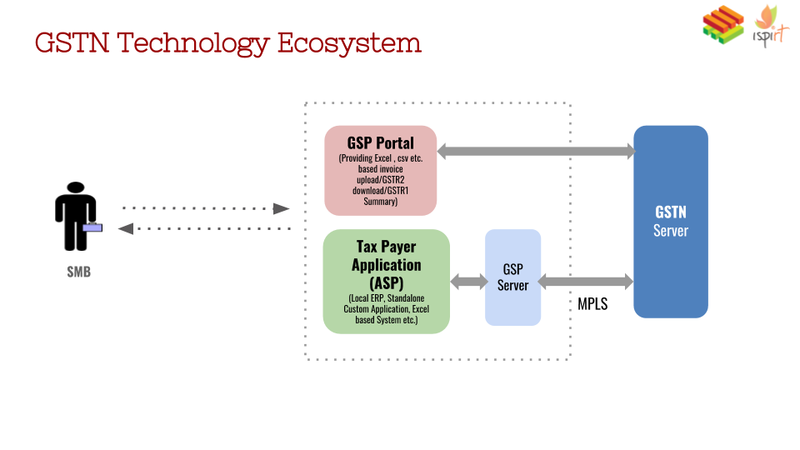 Now imagine adding all your social use cases on top of this beautiful and secure base of UPI. As you may have realized by now, that not only does it create a completely new paradigm but also increases the value by an order of magnitude (because of the network effects). Once the wheels of motion start on any evolutionary path, it becomes almost impossible to stop them. The natural extension is that this category is bound to grow in India as well both in numbers and value (give the fact that it has already reached to 10s of billions of dollars in the west (US) with Venmo and the east (China) with WePay). The key thing to remember here is that in any new economy, it requires a fresh approach and outlook since the positioning is different from traditional P2P players and hence the product delivery and experience also needs to be different for the user. There have been numerous examples around the world with large social networks trying to add a basic P2P payments functionality and hoping it to take off in a big way. But it has not worked that well numerous examples like Snapcash (P2P payments via Snapchat in US). The products that work on the premise of ‘this thing/activity can be done here too’ never make the cut. For example – ‘You can send money on Paypal too!’ is NOT what a Venmo user is thinking. Once a consumer associates a product with a certain repeat and high frequency use case, it becomes nearly impossible to change his habit and perception for that product. For example – Messenger has traditionally been a place for sending messages and that is what a user thinks of when he recalls that app (and not for sending money). Ensuring that the product caters to all your use cases to such a minute detail that even you get surprised when it comes to the features! Needless to say that I am more than excited about how the Indian market is evolving in the fin-tech domain (especially with the Indian government supporting it at an awesome level). Look forward to continued awesomeness and magic along the way. SoftwareSuggest is an online platform exclusively dedicated towards Business Software Discovery and Recommendation. We analyze every aspect of the software trends for the customers so that they can purchase the best software from hundreds of such products thronging the market. Since we value the satisfaction of our customers highly, we analyze their requirements with extensive research, and ultimately compile our observations and conclusions in the form of a report. Here is an exhaustive Research Report on the “Customer Purchase Insights For Hotel Management Software”. The following are the conclusive findings of our Research Report. – Most hotel management software buyers were from Maharashtra, followed by Delhi and Karnataka. With 8.5 percent, 7.5 percent and 7.3 percent software buyers respectively, these states tower over other states..
– Requirement for Installation-based software was more than Web-based software; the former crossing the mark with a whopping 64 percent. 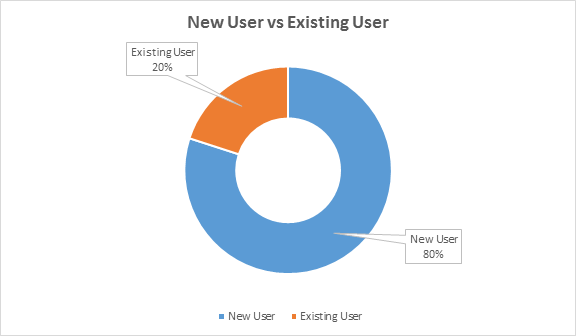 – The Budget preferred by a majority of customers was in the range of INR 0-50,000, with around 65 percent of them belonging to the ‘First time User’ group. – Around 40 percent of the customers prefer 3 demos before taking the purchase decision. Let us have a detailed look at the figures as per our research results. We found that 8.5 percent of hotel management software buyers were from Maharashtra, followed up by 7.5 percent in Delhi and 7.3 percent by Karnataka. Rest of the sections in the Graph is shared by other States. More Software buyers preferred installation-based software to web-based software. The former attributed to 64 percent of the total software buyers. Around 49 percent of customers preferred to buy their required software in the Budget range of INR 0-50,000. This is followed by 28 percent of customers, who preferred the the Budget range of INR 50,001- 1,00,000. The percentage of customers decreases gradually as the Budget range increases and this is clearly demonstrated in the Graph. It was observed that 65 percent of the users were first time software buyers and and 35% were looking to upgrade their existing software. For such buyers, the existing hotel management software was not quite up to the mark, and they wanted to try another software, with more functionalities and better quality standards. 40% of customers usually take 2-3 months before finalizing which Hotel Management Software they want to purchase. Around 15% of the software buyers take the purchase decision in less than 1 month’s time. These are usually first time buyers with a new property. Around 40 percent of customers took 3 demos before opting to buy the paid version of Hotel Management Software. While 20 percent of users were satisfied with just 2 demos, around 30 percent used 4 demo sessions, before they were actually convinced to purchase this software. As per our research, customers look for the below-mentioned features when it comes to buying a Hotel Management Software. Among these, Channel Management, Front Desk and Book Engine are the ‘must-have’ features in a Hotel Management Software. All the above-mentioned facts and statistics have been generated from the data collected by SoftwareSuggest team. We welcome your valuable thoughts or suggestions in the comment section below. You can find a list of Hotel Management Software here. Something very exciting is happening in India.Several Payment Banks are about to launch their operations with a dream to provide banking & transaction services esp. to millions of rural and semi urban un-banked & under-banked households. This is expected to greatly boost domestic remittances, rural savings & reduce dependency on cash. One of the most important questions these banks is how to achieve profitability faster & sustain it while maintaining a low cost structure & capturing volumes. Using modern digital technology is the answer. Integrated with the ecosystem of Bank Mitra (banking correspondents), Aadhaar enabled payments (AEP), Aadhaar enabled KYC, digital wallets, real time payments (IMPS). The recent introduction of Unified Payments Interface (UPI) is a very welcome step by NPCI (National Payments Corporation of India). Analytics: Customers’ data is a gold mine. Their transaction behaviour (deposits, withdrawals, subsidy receipts, categorised expenditures) makes a case for offerings that are truly “personalized”. For example, if a customer has incurred expenses in a hospital, they can automatically be offered a health or a life insurance product. The schemes launched by PM Modi cost Rs 12 (for health) & Rs 330 (for life). If a customer regularly receive say subsidy payments, they can be offered a long term savings product e.g. Atal Pension Yojana. The amount can be directly debited and is totally paperless for customer. Analytics tools (SAS, R etc) combined with “small data” harnessing abilities will make it possible. In UK, the banking regulator is encouraging Open APIs which in simpler words means encouraging bank to open up data vaults to fintechs and others who can offer useful products to the customers. BBVA Bank (US & Spain) has made customer data available through APIs. (Note: I assume customer has consented for data sharing). Cloud Computing: Cloud solutions offer unparalleled scalability, flexible pricing models (you grow – we grow) & tight security. If data privacy concerns can be handled, there is a strong case for using cloud when compared to investing in a private data centre. Automate Business Processes: More and more back office processes need to automated reducing dependency on human resources. The digital offerings have to be such that they are fully integrated with bank’s core processes and leverage the modern work flow solutions. Referral Engines: Though the payment banks can’t lend, it doesn’t mean their customers do not need credit. 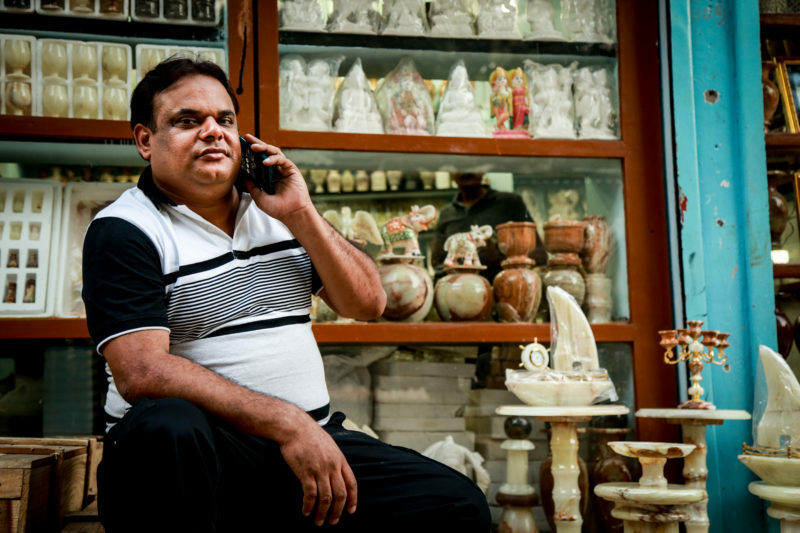 These banks can refer the customer to other ‘full service banks’/NBFCs and earn commissions. Value added data like banks opinion about the customer, risk profile, transaction patterns, income potential can fetch additional revenue for the payment bank. Smart referral engines can be deployed that share info, calculate and track commissions. India needs these payment banks to succeed & sustain in order to achieve a true Financial Inclusion and bring the Bharat under a financial umbrella. India’s IT sector’s tech prowess and their ability to innovate/execute is what the country needs the most. SoftwareSuggest is an online software discovery & recommendation platform. We provide free consultation on software and help SMEs select the right software for their organization. As a part of our business, we collect customer requirements, which when analysed can serve the industry with deep insights. Our learning for the eCommerce industry are presented in this report. There has been a hike in the number of organisations opting for online eCommerce solutions for their business. According to our findings a whopping 80% of the total are first time users. A good number of e-commerce software buyers are located in Delhi, Maharashtra and Karnataka region. We discovered that organizations prefer buying SaaS based over installation based software. The data suggest 69% prefer SaaS based. The spread and depth of functionalities of software is the most prominent factor influencing the purchase decision of the software buyers. Let us have a look at the fascinating figures that we discovered. We found that 35% of the software requirement was from apparel industry and next position is occupied by food and grocery item business (i.e. 20%). Rest is shared by miscellaneous industry like electronics, footwear, etc. 2. From which state maximum requirement was generated? According to our observation, maximum eCommerce software buyers are from Northern region with Delhi (16%) being the kingpin in the list. Next place is shared by Maharashtra (12%) and Karnataka (13%). It can be a good decision for eCommerce companies to invest their resources in these region. 3. What do the users prefer- SaaS based vs Installation based? There has been a drastic shift in the number of users who prefer using SaaS based software when compared to server based software. It has been found from our data that 70% users prefer SaaS based or online software over the server based software. 4. What all features a buyer looks for in eCommerce software? 5. What is the preferred budget in which buyers purchase the software? For SaaS based, it has been found that on an average 50% of software buyers look for an ecommerce software between ₹1000 to ₹3000 per month. Around 18% buyers are willing to spend ₹3000 to ₹7000 per month. Only 7% can spend above ₹10000. For server or installation based, it has been discovered that 80% of software buyers prefer buying in the budget range of ₹50,000 – ₹1,00,000. Around 10% prefer buying in ₹100000- ₹150000. Remaining can afford up to ₹150000 and above. In regards with the changing market conditions, there has been a hike in the number of retailers opting for online stores for their business. We discovered that around 80% of the software buyers bought software for the first time. 7. What is an average number of products showcased by merchants using eCommerce software? The data which has been collected by our team revealed that 17% of merchants prefer showcasing around 100-200 products on their website. And 21% of merchants prefer showcasing between 200-1000 products. Only 8% showcase above 1500 products which is quite less. Our findings suggest that for a large percentage of software buyers, it takes around 3 to 5 weeks to decide on a solution. 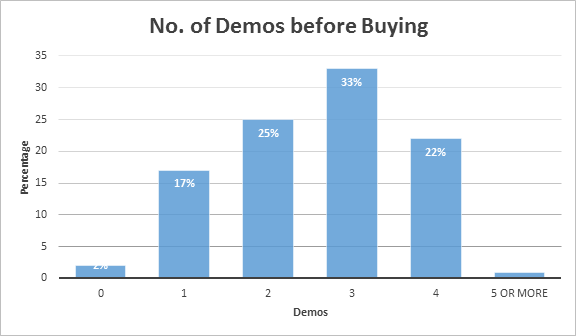 We found that maximum software buyers usually take around 3-4 demos to decide on a solution. A software buyer looks for multiple features before purchasing any software.The depth and spread of functionality of the software is one of major factors. Have a glimpse at the other factors. The report has been generated from the data being collected by SoftwareSuggest team. You can give your valuable thoughts about the report in the comment section below. Also, find the list of eCommerce software solution with software demo, comparison chart, and many other values to help yourself select the right software. In Q1 2016, we saw our hard work payoff. We achieved some notable milestones. We became cash flow positive and our annual revenue rate (ARR) grew by 3 times in 3 months. We expanded our customer base to 68 countries (with over 90% of the revenues from outside our home base), and doubled our team to 50. Our Average Revenue per account (ARPA per year) has doubled to $10,000. Above all, we pushed ourselves to become one of the top 2 bot prevention vendors across the globe! This is quite an achievement, and I’d want to share some of my learnings on what worked, and how we got there. We are ShieldSquare – a startup based out of Bangalore that has come up with a world-class solution to fight bad bots that scrape content, spam forms and engage in various forms of site abuse. We started off in late 2013 with a founding team of five incubated at Microsoft Ventures Accelerator, Bangalore. We worked hard on building the product and refining it by working with early customers till the first half of 2015. We launched ShieldSquare for the global market in mid 2015 and started getting good traction. We decided to shift gears and accelerate the business growth for the year 2016 and this is how we went about doing the same. We initially focused on a low-touch approach in getting leads via inbound channels. With the right keywords, and after a lot of optimisation, we became the No.1 in search ads. We started getting a good number of leads, and this also helped us secure a top global financial portal as our customer. However, as the average deal sizes through the inbound approach were small, we kickstarted our outbound marketing campaigns with aggressive sales targets. We launched personalised email marketing across different verticals, analysed the technologies our prospective customers were using and focused on them. This helped us reach out to the Europe and US markets, and win marquee customers – still keeping it a low-touch approach. We wanted to have a win-win situation for our customers (lower total cost of ownership) and us (cash flow and predictable business growth). We removed monthly subscriptions, and started providing significant discounts to customers that opt for annual subscriptions. Why? Because we believe that the the cash paid today is many more times valuable than the same amount paid after a year. If the valuation of the company increases by 5 times over 12 months, the cash being realised now is 5 times more valuable than the same amount realised after 12 months. We now plan to expand this strategy to incentivise customers that go for 3-year subscriptions. Then Came The Growth Hacks! Our regular efforts resulted in regular leads, but we wanted higher conversions with minimal touch. We launched a few growth hacks that are first in this industry, to increase our conversions. Our free-forever diagnosis plan helped our prospects try, and experience our product with no upfront commitments. Our free tools ScrapeScanner and BadBot Analyser provided reports that enabled our prospective customers understand the need for ShieldSquare and prioritise it internally. One way for businesses to reach positive cash flow is to get the team to work 2 times harder, cut costs, and the like. But our team was already working 2 times harder and our costs were tightly managed. Another way—the more sustainable way—to reach positive cash flow is to grow revenues! We chose this path for becoming cash-flow positive! Growing revenues require building solid sales, marketing and product teams, and we invested on growing our teams across functions and bringing in passionate talents to drive these teams. There are certain things that might seem unimportant, but rather carry great value. Our employees at Bangalore enjoy free breakfast, lunch and snacks, while the same will be implemented soon for our folks in the Chennai, who are already beating the heat with the free tender coconuts we offer twice a day. We steered our focus away from activities that are of less or no value to our business, like attending feel-good/networking events. Rather, we reached out to our advisors and mentors whenever we needed guidance and advice. We have restricted ourselves from meeting prospects until we qualify them. But we keep engaging with various players to get better educated about the market, trends and customer requirements. As we were focusing on building the business and not raising funds, we have politely refused the calls and meetings from VCs who wanted to know about the business. Yet, if any of them insist on learning more about the exciting things happening at ShieldSquare, we invite them to our office to meet the team. This really works as only those who are serious will come to our office to have a conversation, while the others drop out. The aforementioned are the key learnings from our own trial and error experiments as well as interactions with our awesome customers and advisors. The key takeaway from these learnings would be to believe in our own instincts instead of reinventing the wheel. The overall experience of developing a stellar security SaaS product for the world was amazing! As it turns out, the feedback we get from our customers are equally overwhelming, and yet it reminds us of the fact that the journey has just begun, and we still have a long way to go. Guest Post by Pavan Thatha, Co-Founder & CEO of ShieldSquare, one of the fastest growing Saas Security company globally. Valuefy was started in 2010 to empower fund houses to make informed decisions better and faster. Vivek Singal, a B.Tech from IIT Bombay and Sharad Singh, an MBA from IIM Ahmedabad worked together at Fractal Analytics, an analytics firm, before starting Valuefy. Where did the story of Valuefy start? VS: “Whole science around the portfolio management is a very niche play. Valuefy has been serving Indian players so far. To give you an idea, we are servicing 2 of the top 3 fund houses of the country. We have cemented our place in an Indian market. We picked up analytics as a domain since number crunching was our forte, coming from our experience with Fractal Analytics. We were intrigued to find the frameworks and algorithms that helped the fund houses make decisions. We wanted to understand if there was any tool that they were using to decompose their performance, analyse returns, and understand what are the drivers. What were your major road blocks in your journey, and how did you overcome them? VS: “First off, it is very difficult to do a product strategy in this kind of a market. Our clients are very comfortable with excel as a tool where they can manage their reports on an ad-hoc basis, even though it can only give 10% of the information. Our study says that 60% of a fund manager’s time goes in understanding and processing the data which leaves them with very little time to analyse the performance and the portfolio. The problem is that they are so used to it, that it is very difficult to break this pattern and bring the adoption of technology amongst the fund managers. What goes into marketing such a niche product? We have created a global advisory board. It includes people who have experience in the domain, people from our competition, also, people from the academia who are helping us with it. We have formed some key partnerships with global conglomerates. It helps as a marketing platform as well as a distribution channel. What is your advice to people who want to startup? Identify the market correctly. We served the Indian market for a very long time. While our market was global, we spent a lot of time on Indian markets first. So you will need to take the decision and define your market. Get the connect to the market. While you may be good at creating something, but a venture needs both a good product and good marketing and sales. So plan accordingly. Keep faith in your journey until you decide that you have given a fair chance to it. Valuefy has definitely established that B2B businesses focussing on revenue generation and profitability can create a sustain an enviable growth. We wish Vivek and his team all the luck in their journey. Let us start with a simple fact, no one can dispute over the countless benefits technology has brought us. It has allowed us to improve, perform and connect our resources beyond imagination!! Whether you work in a company or run your own business, time management is always on top of your mind. By properly managing time, the organization can know the amount of work allocated to the employees, how long the employees spend in doing unproductive tasks and how many of them are doing over-time. With this, organization can easily calculate their employees productivity. Moreover they can pre-plan their agendas and finalize company’s work schedule. But, what if your time management software also facilitates the feature of attendance management? This will be an added advantage as the origination can keep an eye on the regularity and punctuality of an employee. Because, if company has a comprehensive and authentic time and attendance management softwares, it can easily organize the work with proper synchronization. Here is a list of “#MadeinIndia” Time and Attendance Management Software to consider. Timereckon: It is a web enabled time & attendance management software that can be seamlessly integrated with any payroll system. In case of time records processing, it provides an Enterprise web – based solutions. Moreover, it has comprehensive security layer which is accessible to supervisorial or managerial level only. Timereckon also allows integration with HR, Finance and Payroll Professionals so that they can automate the entire attendance and leave management process. It helps in generating extensive reports and has a large database for maximum storage. Timecheck Software: It is an enterprise grade web based solution with strong features to simplify Time and Attendance management process. Moreover, it provides immaculate solutions for improving business productivity. It integrates with payroll software and ensures on-time payments of salary. It provides intuitive dashboard and flexi-mode options for overtime management and terminal configuration. Some of its value added features include visitor management integration, Bi-lingual support, user group management and work order management. ZingHR Time and Attendance Management Software: This time and attendance management software ensures that organization can keep track on various employee activities, irrespective of their locations. Moreover, it measures time spent on creating business policies and has a user-friendly dashboard. Thus, the organization can propel its productivity and utilize all its resources. Timemate: It provides an organization the facility to reduce the processing time of employee time sheets and decrease human errors in it. In addition to this, it provides biometric time and attendance system which can seamlessly integrate with many hardware devices. Timemate has various solutions such as fingerprint scanning, swipe cards and hand-on punches which provides authentic attendance report. Moreover, it facilitates graphical representation of events & schedules and it allows the access of attendance reports via internet. TimeSheet: Managing time spent on each job by a particular employee can be a daunting task. Therefore, Timesheet software is used as it is highly customizable & can be used by organizations of all sizes. Moreover, it gives enterprise-class time tracking solutions at very affordable prizes. It makes comprehensive reports of time management of employees at a rapid rate. It also provides a “to-do” manager to keep track of small and personal tasks. Some of its top-notch features include auto-locking of time sheets, intuitive dashboard & comprehensive reports with minimum data entry. Zoho: “Attendance Management is now a breeze” this is the tagline used by Zoho attendance management software. Its time tracker helps organizations to regularly monitor team’s efficiency thus improving their overall capacity. Its timesheet helps companies to analyze employee’s activity and how much time has been registered on each activity. 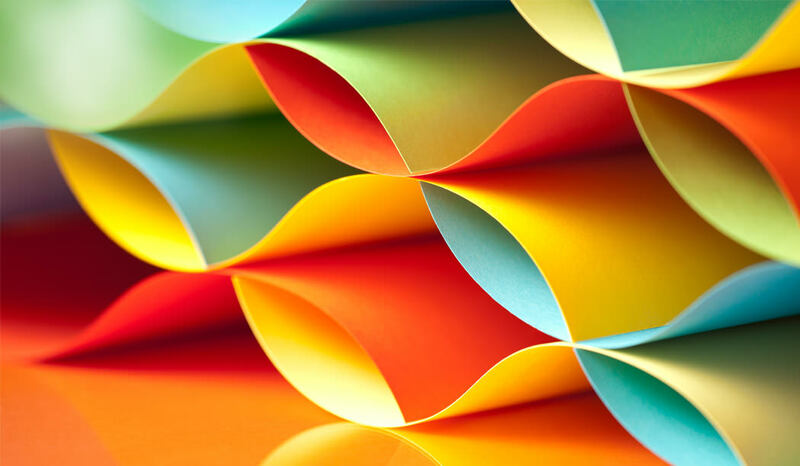 Zoho time sheets are facilitated with hierarchal structures and customized time-log templates. Timesheets also records Log-billable hours and makes sure that the employees are paid for their over time. Moreover, it enables organizations to record all work related items cohesively at a single click. Cost: Free up-to 5 users. Standard: Rs.2340/month up-to 25 users. Premium: Rs.4500/month up-to 50 users. Adrenalin: It enables the organization to have a 360 degree view of employees working hours thus provides authentic analysis of their productivity. Adrenalin provides accurate data collections of employee’s information which is the crucial step in attendance management. Along with this, it helps to redefine attendance capture mode through integration with external time capturing devices. Moreover, it provides various reports to monitor attendance, regularity and sign-in / sign-out information of the employees. Time productivity is the key to success of any organization. With this, it is imperative that it should be managed properly. Moreover, the above mentioned time management software amalgamate with other features such as payroll and attendance management thus providing additional facility to the company. Optimizing and synchronizing time dwells well if managed properly. Therefore, use these software in order to enhance your organization’s productivity. Moreover, if you are looking for free and open source time and attendance management software you can check it out here.